Best Torrent Clients: Looking for the best alternative to uTorrent? BitTorrent– may be the miracle of our generation. Surely the best way to transfer files over the internet! And an integral part of this whole system is a Torrent client, the middle man between the seeders and the peers. Disclaimer: Though these tools/Softwares are available for free of cost and legal, but that doesn’t mean downloading content via torrents is legal. Make yourself familiar with your country’s copyright laws before going for a movie, music, software, or game download using these programs. It seems to be the easiest torrent client for casual users who want to keep themselves away from confusing features. You just need to paste the torrent file or magnet URL to start downloading without any further ado. It’s quite young compared to veterans like BitTorrent. It came into existence in 2017 and quickly gained popularity as it can run inside a web browser without installing anything. Now, it’s available in form of an app for Windows and other OS. It offers a minimalistic interface for torrent download. Also, you can watch movies and all other video files without downloading with the help of built-in player. You can add external subtitles and stream video content to their Chromecast devices without any hassle. We got somewhat faster downloading using WebTorrent. It has landed at the top of our best torrent client list. To be specific, it is basically a media player available across different platforms (Windows, Ubuntu, MacOS). But, still what makes it unique is the fact that it can also be used for torrenting with entertainment on the go. So, it makes it a free torrent as well. The best part is that it comes pre-packed with a browser, so you won’t actually have to change windows to search out for torrents. 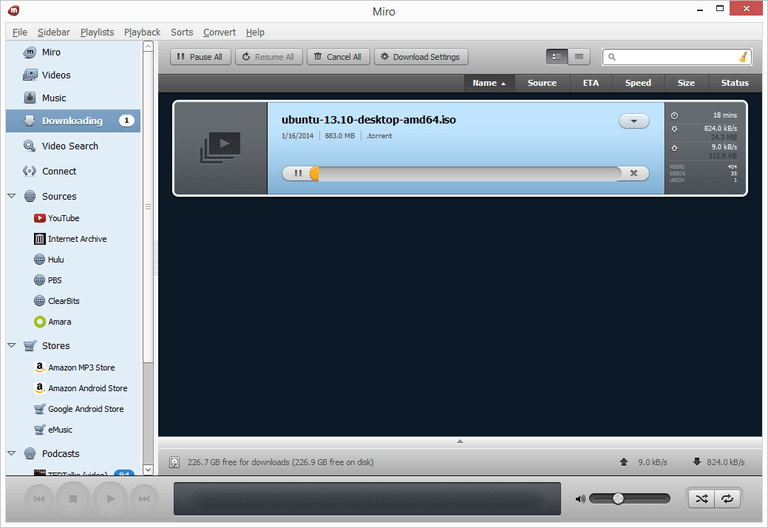 Also, users can share the Miro files over the network and to Miro iPad app to stream the already downloaded media. Fix: Windows Cannot Be Installed To This Disk. With a built-in RSS reader and a web browser, it is a very solid tool for the purpose of downloading files over the internet. For the advanced security, this client comes with the option of password protection and a simple and attractive interface makes it even more viable. It works well with Windows, Linux, and macOS. And added to all these is the extra advantage of going anonymous and remote control!! Thus, it makes itself eligible for one of the best torrenting clients 2018. This free client available over different platform boasts of an inbuilt virus protection and remote access. The free torrent program has got the useful features like scheduled bandwidth limits, long-term seeding, and CometID VIP Acceleration. One can decide the bandwidth limits and whole advanced schedule option wherein user has got the freedom to tell in advance when to start and when to stop, does come in handy. This mammoth is known in the town for its very easy user interface with minimal confusion and optimum performance. One has got the freedom to adjust the max upload slots and speeds, as well as download speeds and encryption. Another good thing is that this free torrent client has got a huge horde of plugins customized to make the torrenting experience worth going the step. It is available for Linux, Windows, and MacOS. The software which is also available for android users has the specialty of hosting internet radio stations and ability to add custom streams. You can use it on Windows, macOS, or Ubuntu OS. 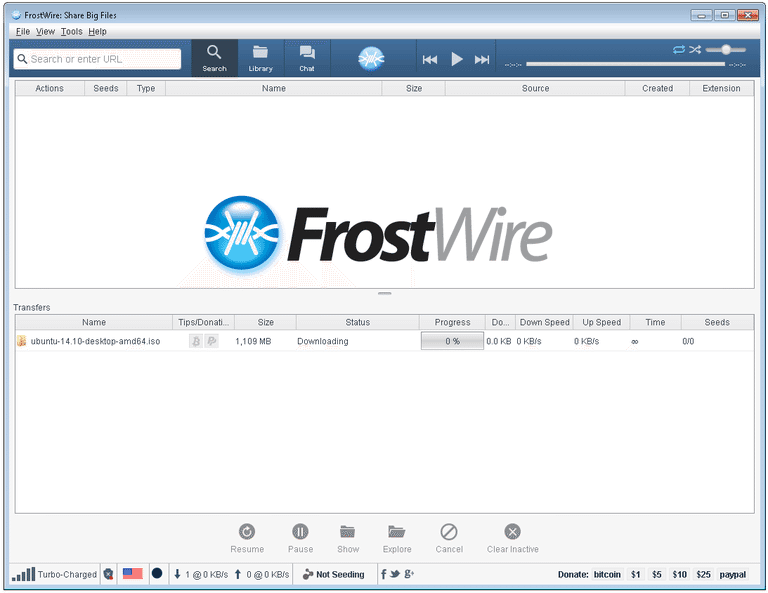 The FrostWire torrent client torrent files on several websites at once, and then you can sort the results by the file size and seed count. And feature worth a mention is that while you are online you can chat with other FrostWire users through their community chat room. This free torrent program, formerly known as Azureus comes pre-packed with features like such as media playback support and a built-in browser via which you can search for torrents. It comes with a folder directly connected to iTunes, you just need to drag the downloaded media into it and it will get updated in the iTunes library. The biggest advantage is that it lets you control the whole process from your android device itself. So from now on, you can check your downloads occurring on your PC at home, from your classroom itself. It’s one of the best torrenting clients available. Note: This torrent client is available as an ad-free and lightweight version known as Leap. The name nowhere deceives its way of functionality. It is indeed the lord of the BitTorrent. It is available for Windows and MacOS. With its advanced features like the ability to stream video/audio before the download is complete, and search for torrents inside the program without leaving the client, it is worth a try. You can password protect it and add RSS feeds to keep a track on new torrent releases. This one implies an innovative idea in a sense that it downloads and seeds torrents for you and then lets you download the files as regular HTTP data. 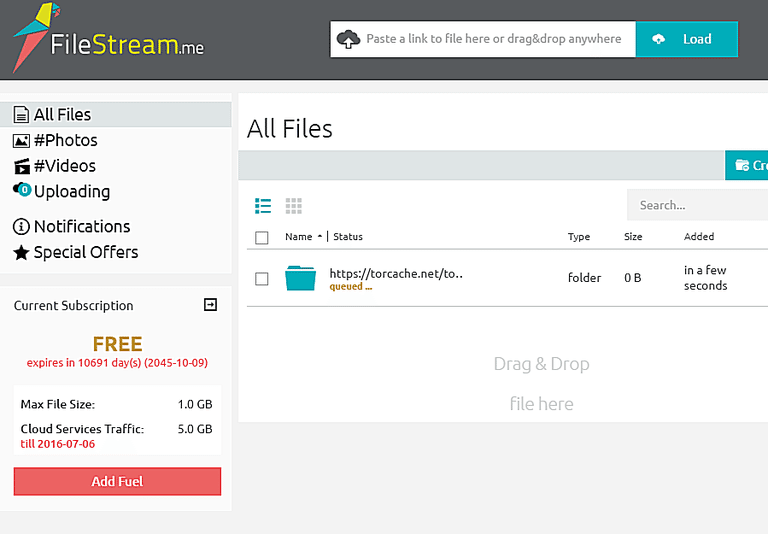 It works similar to Filestream. It makes into the list of best torrenting clients of 2018. Because of this only it is used by users if one’s ISP is restricting a particular torrent to enter your hardware. The only downside the whole process is that it allows your torrents to be no larger than 1 GB. Otherwise, it’s the best bet to try. It has got a similar way of operation to that of ZbigZ. This one also downloads the required torrent file and uploads it to its own server. This way you can later download it later through a normal browser. The other side of the coin is that its free version is ad-supported and limits torrents to 300 MB while giving you three days to download your torrents. You can fetch two torrents at once. However, it might restrict you from downloading too many files at once. The advantage is that it goes anonymous hiding your IP address and gives flexibility of resuming downloads, streaming video and audio files, but doesn’t have any monthly limits. It comes with an Android client. 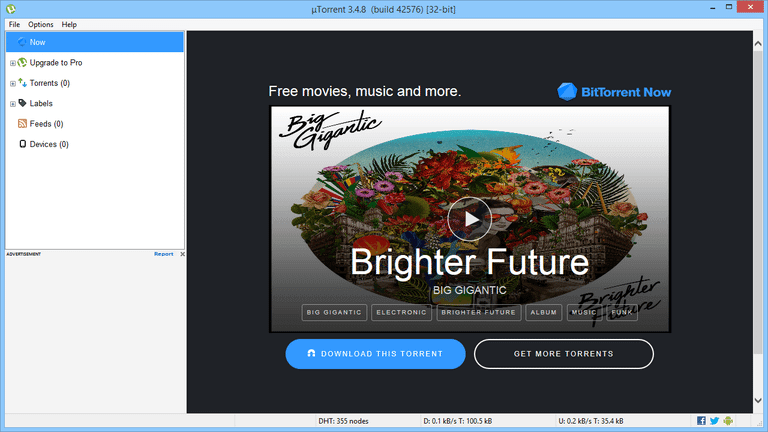 Was there any doubt that this one would top our list of BitTorrent clients? This torrenting client has an installer with tiny size and the free torrent client uses only a fraction of system resources while running. It gives the ability of RSS feeds subscription and downloads new torrents items of that feed. Supposedly the best, fastest and most used client on the planet. It comes with a feature called uTorrent Remote which allows you to monitor and administer it remotely. In short, you can control the whole torrenting bonanza from your torrents device itself. According to the latest news (April 21, 2017), the upcoming version of uTorrent will have a web browser version. This is the list of best torrent clients. Stay tuned to The ReporterTimes for more.